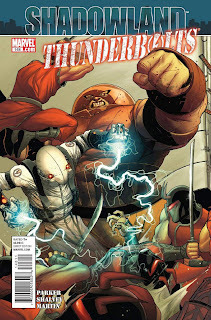 Sure the latter part of Thunderbolts #148 is filled with ninjas in sewers getting all Voltron (Power Rangers for the young readers) on the Thunderbolt squad, but the highlight of this comic of the day comes in the male mess hall of The Raft, the high-security prison. Every team, or pack of friends in general, should have a big friend that. He is easy going because he knows that his size will protect him and that no one will mess with him...basically, people fear the big dude and the big dude knows it. In the Thunderbolts, the big dude is in the form of Juggernaut. He is as big as they come and he has been in more battles than any convict on the current Thunderbolt team. So what do other group members do with the big dude? They befriend him...and then kill a man using the hulking bud as a shield to hide behind. Crossbones, the Captain America attempted murderer, is no fool...a psycho, but not a fool. His scene, which ends in the assisted kill of some prisoner talking trash, is a great moment which shows team members bonding and starting to act as a team outside of missions, as well. Seeing two sly bad guys work together is fun, especially when it ends in murder.